RSPCA Australia is a Federation of 8 independent State & Territory RSPCA bodies called member Societies. RSPCA member Societies do much of the hands-on work traditionally associated with the RSPCA such as the operation of shelters and the Inspectorate plus community education and fundraising. A puppy farm (also known as a puppy factory or puppy mill) is an intensive dog breeding facility that is operated under conditions that fail to meet the dogs’ behavioural, social and/or physiological needs. Puppy farms are usually large-scale commercial operations, but inadequate conditions may also exist in small volume breeding establishments which may or may not be run for profit. What can be done to end puppy farming? RSPCA Australia considers puppy farming to be a significant national animal welfare issue. 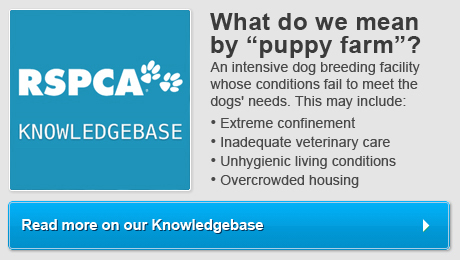 RSPCA Australia released a Discussion Paper on the issue in January 2010 and received over 100 responses which were used to help develop a document presenting a potential way forward to end puppy farming in Australia. The resulting document - End Puppy Farming - The Way Forward - presents a series of problems, desired outcomes and recommended ways forward which, if implemented, would bring a complete end to puppy farming in Australia. Sign up to our Close Puppy Factories campaign. Become a Smart Puppy Advocate - tell your friends and family how to avoid supporting puppy farms.